A few days ago I spoke a little bit about the Doctor Who television movie in the context of the recent mini-episode. I said some things that can't really be taken back. I mean, they could. I could edit the post, and then, in a way, they would be taken back. I'm not going to do that. I stand by what I wrote. So, in a way it is about my integrity, but I think it might also be a lot about my laziness. Let's say that it is a combination of the two, also there is a slippery slope right there, and I probably want to stay away from that. So, it's three things. Except the first and third are really just about integrity, but one is about an immediate sort of integrity, where as the other is sort of an ongoing dishonesty. I think there is a distinction. Anyway, where was I? Right. 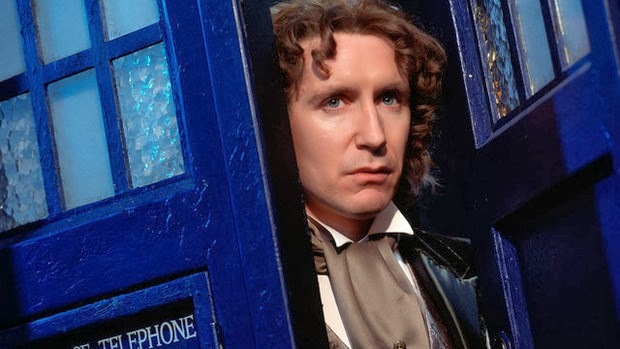 It isn't a great story, but Paul McGann is fantastic in it. In a lot ways he is the first of the modern Doctors, as distinct from the classic Doctors. He is definitely more in line with the Doctors that followed than the ones that came before. As I also mentioned previously, I really like the 8th Doctor, and the way he is portrayed. 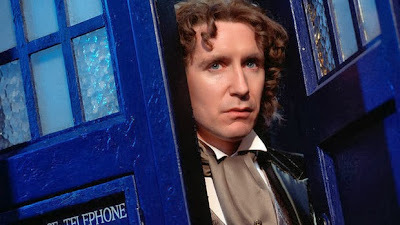 Paul McGann does a really good job, even in the television movie, of making you like his incarnation, which is why I think you should watch it. No, seriously. I know what I said earlier, but if you like the show you are probably going to like this to some extent, and seeing the bridging Doctor in action in his one and only televised story is worth the one hundred odd minutes of your life it is going to cost you. Also, it's a regeneration story, which are nearly always worth the format they are stored on. Not every Doctor gets bookending regeneration scenes. At this stage most of them have gotten them (4th, 5th, 6th, 7th, 10th, and now 8th, AND 11th by the end of the year), so it isn't really rare. You might be wondering at this stage how I suggest that you get your face around Doctor Who, the Doctor Who television movie. Well, if you're an Australian, and happen to be in Australia, or not Australian, and happen to be in Australia, then you can watch it on ABC iView right now. 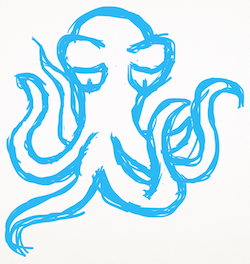 Once again, this is at the time of writing. If it isn't there later, I mean, that is hardly my fault. Maybe if you read my blog more often, this wouldn't keep happening to you. If you're Australian and aren't in the country, or are one of the many foreigners who aren't in Australia, you might have to get it on DVD or VHS. I believe in you.